What’s recommended against the Dragon and Scheveningen? Looks interesting to cover both the modern h3 and my old favorite Be2 vs Najdorf. 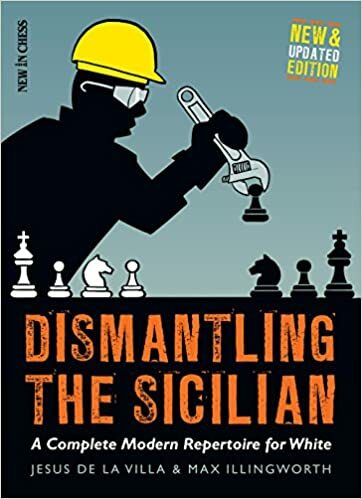 The updated edition appears to be out now: https://www.newinchess.com/dismantling-the-sicilian-new-and-updated-edition, with sample pages. If 6.Nxc6 isn't strong then everyone would play 5...a6. I actually do think that Black gets a lot in return for the 5...a6 move. First, there is 6.Be3 Nf6, with extra options against the English Attack (which I personally like for Black). There is also 7.Qf3 Bb4! when I don't think that White has much of anything, unlike after 5...Qc7 6.Be3 a6 7.Qf3. Against other moves you can obviously transpose to a "main line" with 6...Qc7 if you'd like, but against the Classical as Kylemeister noted, heading for a Scheveningen might be a little better than usual for Black (or at least keep more options open). There is also the original Taimanov idea of playing ...Nge7 or ...Nxd4 followed by ...Nge7-c6 in some Classical move orders (I wouldn't play them against everything). Like all move order nuances, there are pros and cons. But if Black has nothing to worry about after 5...a6 6.Nxc6 I see absolutely no reason for him not to play it, as he can either transpose into 5...Qc7 lines or advantageously avoid the move (such as after 6.Be3 Nf6 7.Qf3?! Bb4!) without negative repercussion that I'm aware of. Regarding 7. e5, I was reminded that in an update of some months ago GM Roiz considered 7...Qc7 8. Bf4 dangerous for Black. Does 5...a6 give any extra options against White's classical Be3/Be2 setup (compared to 5...Qc7)? The few times I've considered taking up the Taimanov, the Classical has been a big issue. I tried just going into the Classical Scheveningen, but didn't like the positions at all. They just felt too passive for my taste. And in some of the ...Bb4 lines it looks like White is playing for two results. I suspect because you're allowing the (fairly critical) 6 Nxc6 variation without getting all that much in return. You get extra options against the English Attack, but it's not clear these are any more effective than the normal lines. As far as I understand you still have to deal with the Be3/Qf3 stuff, and 5...Qc7 6 Ndb5 just isn't very good. Thanks, Bragesjo. I wonder, though : if it's really all that simple for Black, why does almost everyone play 5...Qc7? The whole point of that move order was to avoid the difficult 6.Nxc6 lines. If those variations really are fine for Black, then everyone should start playing 6...a6 again for the reasons I gave in my last post. Yes it was the line I meant. I am not shure if whites position is that easyer to handle, Attacking the flexible thought it was difficualt for white to come up a sensible plan. I have also played this line vs a friend i blitz games and I used to scrore good untill he started to play Kf8. About 7 e5 I have never seen this recommended for white in any of my books. Attacking the flexible writes that it was once popular but nowdays it has practically dissapered from tournamnets. The seem to think that the critical posiotion arrises of 7 .. Qc7 8 Qe2 Ne7 9 f4 c5 10 Ne4. They wrtite that black get considereable chanses for an attack after 10 .. Nf5 11 Bd2 Bb7 12 0-0 Qc6 13 Ng3 Nd4 quating a game from 2013. Attacking the flexbile went for Be3 intending Qf3 and transposing to mainlne if black plays Qc7. "Modernized the Open Sicilian" did also not play the Nxc6 system. I my view whites two most promesing lines vs Taimanov is either the modern 6 Be3 a6 7 Qf3 or the g3 system. The traditional English attack is not as dangereus as it used to be in the line and plan recommended by "The most flexible sicilian". Most of my books went for Nxc6 and I have played it in a few games as well. However the recent "Attacking the flexible Sicilian" shows improvments for black in 11 .. Kf8 where they think that white has nothing special so therefore they went for an other line. There is also 7.e5, if I'm understanding your post correctly (I think you mean after 7.Bd3 d5 8.0-0 Nf6 9.Re1 Be7 10.e5 Nd7 11.Qg4). Theory changes over the years, but if I were White and wanted a line against the "old" Taimanov move order that would last forever, I'd choose 6.Nxc6 bc and then vary between 7.Bd3 and 7.e5, depending on mood and current theory. It's hard for me to believe that White doesn't have at least a slight edge and easier-to-play position in those lines. Still, the only time someone played this way against me in a tournament game, I won a nice, scrappy game against a 2350 player, so I have fond memories of it. If I remember correctly, it went 11...g6 12.Bh6 Rb8 13.Rb1 Rb4! 14.Qe2 Rh4!, or something similar. White has plenty of ways to try to improve, though. I prefer playing this way as Black to dealing with the English Attack proper, the fashionable 7.Qf3, and the 5...Qc7 6.Ndb5 line. I'm really surprised that more White players don't play 6.Nxc6, and can only conclude that most try to play the same system against 5...a6 as they have prepared against 5...Qc7. Out of interest, what do you think of Negi's 6.Nxc6 repertoire against the 5...a6 Taimanov? Kotronias & Semkov had some improvements over his analysis in 'Attacking the Flexible Sicilian' (where they recommend 6.Be3 Nf6 7.Qf3, fwiw). I admit that I'm not aware of Negi's analysis; I've put all of my opening/theoretical work over the past 2-3 years into my own book, more or less. But 6.Nxc6! has been considered the best move in that position since at least the 1980s, various lazy White players notwithstanding (those that don't want to learn a separate system of play). As a long time 5...a6 Taimanov player, I think that White's best (if he doesn't want to transpose into another main line) is to simply play 6.Nxc6 bc and now either of 7.e5 or 7.Bd3. Hardly anyone ever plays that way against me, though. I would be interested in any improvements here, also. And here the Rossolimo is not an option. After ...a6 black scores an amazing 60% in my database. The engines think white has an edge, so I wonder what's going on. 7...a6 8. f3 Be7 9. 0-0-0 b5 10. g4. 13. exd5 Ne7 14. c3 Bg7 15. Qh5. Playing through my database, these are all the most popular moves for both sides. So I suppose it is the main line. However, white scores 49% in it, and wins only 17% of games. What other lines deserve attention in the new edition? I know very little concretely about the Sveshnikov, but it's arguably become a victim of its own success. A common view today is that the main line after 2...Nc6 is no longer 3.d4, but 3.Bb5. And no doubt the Sveshnikov is the main reason for that. I wonder if even De la Villa will break with his principled Open Sicilian and recommend the Rossolimo? Probably not, but then he needs to find lines that he can claim give some chances against the Sveshnikov. I'm a club player returning to chess after a long break, and I really like this book. I'm very much looking forward to the new edition and have already pre-ordered it. I didn't see much discussion of the actual lines given by de la Villa in this thread, so I thought I would note some omissions and potentially problematic points. I do this in anticipation of the new edition, where they will hopefully be covered! Checking the Najdorf and Scheveningen recommendations against my database (and sometimes Stockfish) convince me that some updates are needed here, which is entirely unsurprising given the age of the book. and in the 77 games in my database white scores 65%. Play continues 7...Bb4 8. Bd3, and now de la Villa considers many moves, but not the most played move in my database, which is 8...e5. This is a curious omission. White still scores about 60%, though Stockfish thinks black has equalized. I can't find info about this book in the NIC site, although I found this on Amazon so I can now see it's being co-authored with Max Illingworth. It will be an instabuy for me as I've been basing my Open Sicilian around this book, especially the English Attack which I've been having great fun with! Given the positive comments you and many others made about the original version, I was close to buying it many times, but didnt pull the trigger....I might find myself giving in to temptation for Christmas. Quality Chess' ABC tree format style is my favourite. Chess Stars splitting chapters into: quick theory, theory and model games is tolerable. Everyman Chess' games format I didn't use to like, but I can tolerate it now. Since we're on this subject, I found Bologan's Black Weapons to be completed unreadable and despite the favorable reviews, could not bring myself to buy a copy. I think that I know what RoleyPoley means, though it's hard to describe in words. Fully agree regarding the Bologan book. It was the same terrible format with his Ruy Lopez one too. Having to keep jumping back and forth between pages, to find out who played the game, or to see side variations, became tiresome very quickly. Hopefully Bologan will ditch this format for future books. I'm hoping he does a Caro-Kann rep book next. New version of this book coming out in December. Given how popular first one Is, I'm keen to see it. Hope the layout is nicer though. Can't stand NIC or Gambits presentation....ruins perfectly good books. What exactly do you dislike about NIC's and Gambit's layouts? I don't see any obvious problems with them. I dont know how best to explain it. I'm not particularly keen the font/typeface used, also the content often looks too clustered or as if it has just been shoved together. I prefer more spacing (NIC's book on the Petroff by Cohen to my eyes looks atrocious for example). Sounds like this could be interesting for me. I like to get an overview then see if I can get deeper into things myself. It takes longer but sticks in my mind more that way. What's the remedy against 5...b5 ? It scores very well. De la Villa gives 6 Bd3 on page 176. I did ok with it. What did you play vs. 2...d6 & 2...Nc6 then? "Backdoor Rossolimo" and I fared pretty well with it. I still feel more comfortable playing that way, but as my play has improved, so has that of my opponents and I gradually weaned myself to the Open Sicilian... most of the time. My version of the book has a detailed table of contents (showing the moves of the variations) + index in the end with a variations tree, plus diagrams of key positions. Yes, mine has that also. If that works well for you, that's great. But I am so much more accustomed to the "tree" style that I decided to create this one. I like the Dismantling repertoire, but it is sometimes difficult to navigate so I made an index for the book. "10...h6 would normally be a transposition to the lines studied in the previous game..."
But the previous game in the book has nothing in common with this variation . Seems this paragraph stays from the Spanish edition of the book which contains one more game, but again it was not a good example. 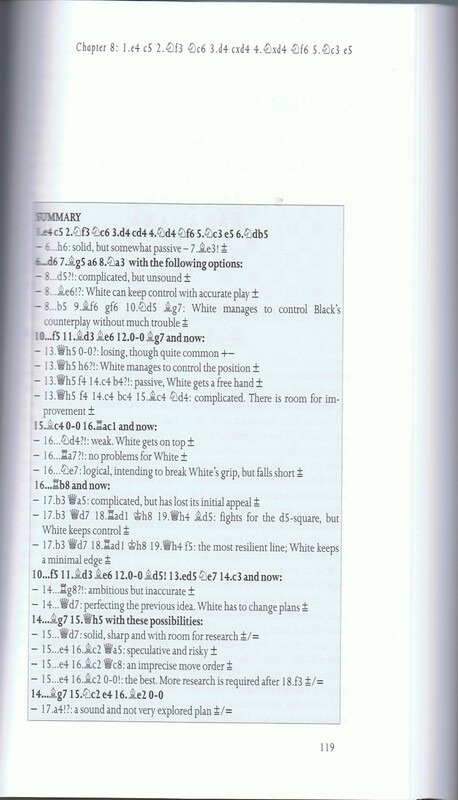 Also it should be noted that the author does not consider 10...h6 as the main move in that position despite the fact that this is considered the most modern treatment of the variation for Black and the book has been published in late 2009 when this was already proved to be the main line. Instead he uses his own game played long ago in 1996 which shows how Black should not play this line. The most precise order. 7.f3 may lead to the same positions, but we must take into account two disturbing moves: 7...d5 and 7...Qb6. Does anyone have experience with either of these 7th moves? How "disturbing" are they really? I ask because if White tries to reach a straight English Attack against the Classical Sicilian he can't avoid them so easily (i.e. 6.f3 e6 7.Be3 d5!? / Qb6!? or 6.Be3 Ng4!?). Another glowing review, by Arne Moll (a Dutch player who is around 2200) at Chessvibes. Compared to Experts I like De La Villa's book much better. I find it very clearly structured, somehow it is really a pleasure to read the book (might also be becuase of the good production)! The repertoire fits well together, of course the bullet-proofness can only be seen in the future! But of course this is a subjective assessment, the repertoire simply fits me better than that of Experts. I also try to play the English attack whenever possible because I think it is the most practicable and dangerous way against the Sicilian. Of the Experts repertoire I didn't like Bg5 against the Najdorf (great variation, but too difficult to maintain, the Maroczy against Accelerated Dragon and the Sveshnikov recommendation was also not my cup of tea. In the Scheveningen/Najdorf after 1.e4 c5 2.Nf3 d6 3.d4 cd4: 4.Nd4: Nf6 5.Nc3 e6 6.Be3 a6 7.f3 b5 8.Qd2 Nbd7 9.g4 Nb6 10.0-0-0 Bb7 11.g5 Nfd7 12.Bd3 Rc8 13.Kb1 Ne5 14.Qe1 he doesn't consider 14. ... Nbc4 which strikes me as a more logical move than 14. ... Nec4, as it makes room for the queen. Now 15.Bc1 seems logical, but perhaps is not best in this position after 15. ... Qb6 or 15. ... Qa5. 16. Na4 Nxd3 17. cxd3 Qa5 18. Bc1 Na3 19. bxa3 Qxa4 20. Qxb4 Qxb4 21. axb4 d5 22. Rxf7 29. Rxe7 Rxe7 30. Rxe7 Bc6 31. Kb2 Rd7 32. Re6 Bb5 33. a4 Kf7 34. Rb6 Bf1 35.
h4 Re7 36. b5 axb5 37. a5 Re6 38. Rb7 Kg6 39. Bd2 Re2 40. Kc1 Re4 41. Bc3 Kh5 42. Rxg7 Kxh4 43. Bf6 Kg4 44. Rxh7 Kf5 45. a6 Ra4 46. a7 b4 47. Bd4 Bd3 48. Re7 b3 49. Nxd3 16. cxd3 Nxe3 17. Qxe3 Qb6 18. f5 Be7 19. h4 e5 20. Nc2 Bd8 21. f6 gxf6 22. Bd8 36. Rf3 Rg2 37. Kb3 Rh2 38. Rg3 Rxh5 39. b5 axb5 40. Ra7 Bg5 41. Ra8 Kd7 42. The Mamedov game seemed better for white, but korneev's game was very wild! The other variation in the Najdorf has always brought my problems with white: 1.e4 c5 2.Nf3 d6 3.d4 cd4: 4.Nd4: Nf6 5.Nc3 a6 6.Be3 e5 7.Nb3 Be6 8.f3 Be7 9.Qd2 0-0 10.0-0-0 a5!? 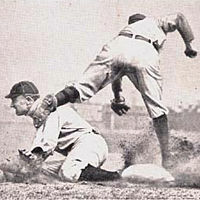 and now de la Villa offers 11.Bb5. what do you think of this move? 11. ... Na6 12.Qe2 he now doesn't consider 12. ... a4!? as played by some strong players (including Bu Xiangxi). What would you suggest for white? Some sources have thought that Scheveningen line to be += (e.g. Anish Giri in the last Yearbook after 11...Qxd5: "White has many moves, and he is slightly better I think"), and some have thought it to be equal (the same can be said of various lines in the Keres). It would seem unsurprising for de la Villa to skew to the White-favoring side in such cases. I found a curious hole in that Kan chapter btw: In the recently popular line 5.Nc3 b5 6.Bd3 Bb7 7.0-0 Nc6 8.Nxc6 Bxc6 9.Re1 he gives 9...Qb8, 9...Qc7, 9...Be7 and 9...Nf6 claiming a clear advantage against all of them. But he doesn't mention 9...Bc5 which is overwhelmingly the most popular choice in recent games! Thanks for instructive post Stigma! Not 100 per cent relevant I know, but I cannot resist highlighting this inspiring recent game by Josh Friedel against the above line, but with 9 Qe2. I received my copy yesterday, and I was quite impressed by it. Besides being fairly comprehensive, it's also original. Futher it's very well-produced. According to de la Villa, only the Najdorf and the Sveshnikov give prospects of equality, though he marks the critical positions "+=/=." But having looked at some of the final positions, I'm not sure that all of his += evaluations are entirely objective. Maybe that's not much of a criticism, since "+=" is inherently subjective. But I think that strong Blacks often play straight into some of his "+=" positions. I'm not sure in particular that it's += after 1.e4 c5 2.Nf3 e6 3.d4 cxd4 4.Nxd4 Nf6 5.Nc3 d6 6.Be3 Nc6 7.Qd2 Be7 8.f3 0-0 9.0-0-0 d5 10.exd5 Nxd5 11.Nxd5 Qxd5 12.c4, which is his main line against the Scheveningen. He rates the Scheveningen only a four-star defense, alongside the Classical, while the two mentioned above get five stars. But if the Scheveningen only gets four stars, I would think it would be on account of the Keres Attack, and not the line just quoted, which looks tepid to me. I looked also at some of his key positions in the Loewenthal and the Dragon, systems that he gives only three stars, and there as well there seemed to be some evaluations that could very well be debated. In particular the Chinese Dragon appears to hold up against his recommendation. Another hole I noticed is that after 1 e4 c5 2 Nf3 d6 3 d4 cxd4 4 Nxd4 Nf6 5 Nc3 a6 6 Be3 e5 7 Nb3 Be6 8 f3 Nbd7 9 Qd2 b5 10 0-0-0 he only looks at 10...Nb6 as opposed to 10...Rc8; the recommendation of Arizmendi and Moreno. 1, "You very rarely sacrifice pieces"&&2, "That's because I spend most of my time losing them instead"
I have spanish edition. Is a second edition much better? The original first edition was dated 4 years ago, and the translated one corresponds to an updated edition. The translation was made by a nice friend of me IM Patricia Llaneza and has many new material, according to the translator. I suppose that the second spanish edition will be published soon. the previously recommended line is still equally interesting and the reasons for the change are less conclusive." In the chapters I've looked at there certainly are a lot of references from recent years, say 2007-2009. The basic repertoire seems to be the same. But 6 years is a long time in the Sicilian! The most fundamental change I've found is a different weapon vs the Kan (Paulsen): In 2003 it was 5.c4, now it's 5.Nc3 b5 6.Bd3 Qb6 7.Nf3 and 5...Qc7 6.Bd3, quite similar to "Experts vs the Sicilian". He comments that it gives similar play to the other (English Attack-style) recommendations, while the English Attack itself is considered dubious against the Kan.
On the move order 5.Nc3 d6 in the Kan, he just gives 6.Be3 and points to the Scheveningen chapter. But Black can try to delay ...Nf6 in this line, and maybe hope to gain something from accelerated queenside play? Moves like ...b5, ...Bb7 and even ...Rc8 can be played before the kingside is developed. Maybe it's no good, but it could have been mentioned. A small point: In the Taimanov chapter the move order 5.Nc3 a6 6.Be3 Nf6!? was ignored in the Spanish edition; now it is met with 7.f4 d6 8.Qf3; the same setup he gives (in both editions) against 5...Qc7 6.Be3 Nf6. 10...f5 looks weakening to me, but in a brief analysis both Fritz and Rybka suggest it. On 10...Qh4 as played earlier by Kantsler White can temporarily sacrifce a pawn with 11.Ne4 Bxe4 12.Rxe4 Qxf2+ 13.Kh1 (threatening 14.Rf4!) 13...Bb6 14.a4 bxa4 15.Raxa4 and I think White has an edge. After pointing out two small omissions I must say that my overall impression of the book is very good and I'm itching to take up many of the lines, something I never got around to with the Spanish edition! To follow up on this query: I would appreciate if any ChessPubber can briefly say how much updating has been made to the Spanish ed? ie, beyond updating on games/lines, has the repertoire been changed at all? IM Georgios Souleidis has a review of the book on his blog (in German); he thinks quite highly of it. Can you please give a scarce overview? Please do so. After my first perusal of the book, and having somewhat more thoroughly analyzed two of the chapters, de la Villa appears to have done an excellent job in presenting a repertoire which is efficient, yet gives prospects for advantage. The repertoire is based on the English Attack where possible. A good bit of main-line theory is presented in the case of systems like the Najdorf and Sveshnikov (against main lines one must play main lines, if one hopes for advantage). The layout is based around annotated games, with summary tables of variations. Against secondary lines de la Villa recommends secondary lines which don't require a lot of preparation, but carry a lot of poison. I especially like this. I have looked most closely at the material on the Nimzovich (2...Nf6) and Grivas (2...Nc6 and 4...Qb6) variations, on which I am somewhat expert (and play as Black). Against the Nimzovich de la Villa recommends a setup with an interesting pawn sac, played by Jakovenko against Llobel Cortell in 2006. I knew of that game, and it is in fact a bit of a problem for Black. Against the Grivas he recommends the seldom-played setup with 7. a3. I had never thought too highly of that, but the variations shown by the author appear to give White good play (though not necessarily leading to forcible advantage). A really good book for friends of the Open Sicilian as White. Clear in concept and presentation; good analysis; useful as a reference book. From initial perusal it looks like an attempt to combine the approaches of 'Beating the Sicilian' and the Khalifman books - a serious undertaking. WIll say more when I have caught up on some sleep - have travelled back overnight from Tunisia. "Our playing style must have its influence as well when it comes to building our repertoire. However, if our style does not involve an open game against the Sicilian, then we should consider whether 1.e4 is right as our first move after all." After a break from chess I started playing again in the mid 90's. I then decided to form a proper repertoire. I used Nunn's "Beating The Sicilian 2". It was a very rewarding read. Previously I had played the Morra gambit with very poor results (and before that the closed with reasonable results.) I then used BTS3 before another (shorter) break. I then switched to 1.c4 using Kosten's repertoire book. The results of chess games are clearly correlated to the overall playing strength. Playing an opening that suits you will make chess more fun and more rewarding. If you enjoy 2.c3 and your results are good, don't change to the open sicilian. Otherwise I think it's a wise choice. The toughest variation is the Najdorf I think. I didn't really like the f4 lines of BTS2 and 3 and I'm not so keen on the Bg5 lines of "Experts vs the Sicilian". The English attack of "Dismantling The Sicilian" looks like a better choice to me. No idea as to overall analysis but it does seem like it might be more internally consistent. I would strongly advise to at least seriously try playing Sicilian main lines. Not so much because you'll score hugely better than with 2 c3 - as ever you're likely to do a little worse in the short term - but you will get exposure to a wide variety of exceedingly rich positions. Long term that can only help I think. Very self limiting to not at least try the open sicillian. I wonder how this book compares with Aagaard's "Experts vs Sicilian". In intro of the book author stresses that given repertoire has fluidness with other recommended lines. That should be very good. As Sicilian Alapin (2.c3) player, I do wonder if I should buy this book and to skip on mainline Sicilian. I'm at 2100, but will I breach Elo 2200 if I study this book, regarding Silian mainlines. Thanks, all good comments are welcome! Especially justified as these lines really aren't especially hard for white to at least make a decent stab at playing. Harder against 6 .. e5 stuff in the Nardojf I suppose. The repertoire is based primarily around the English Attack setup f3, Be3, Qd2 and 0-0-0, as stated in the given pdf excerpt. To cover such an aggressive and theoretical setup in a repertoire book is very ambitious, but in my view entirely justified. To answer rossia's question in the other thread here, it looks like this book is aimed at 1600-2200 players, although I will certainly purchase a copy. I will be particularly interested in de la Villa's opinion on the English Attack against the Najdorf, since the large number of recent Yearbook surveys on lines such as 8...Be7 9.f3 h5, 9...0-0 and 8...Bb4 9.f3 0-0 suggest that Black should fully equalise. The text is now changed to "Former Spanish Champion and successful chess coach Jesus de la Villa presents a complete repertoire for White after 1.e4 c5 2.Nf3." I would have to guess that it's a typo. I would hazard a guess that this is just a translation and update of his Spanish book, "Desmontando la Siciliana". I doubt he'll write a new repertoire on the Closed or the Grand Prix. No one would buy that garbage! According to New in chess this book will be a repertoire based on 2.Nc3. But how followed -- Closed, Grand Prix, a Bb5 system, Nf3/e2 and d4, some combination of these? You can find information on New in Chess' website, Book publishing program. They state: "Former Spanish Champion and successful chess coach Jesus de la Villa presents a complete repertoire for White after 1.e4 c5 2.Nc3. Each variation is clearly organized with its history, ideas, statistics, examples of tactics and strategies, and instructive games." But a close look at the book's cover shows a white pawn on e4 and Knight on f3 against a black pawn on c5. So, there is still hope for the Open Sicilian addicts! Where do you have this information from ? Indeed, although this doesn't rule out the Open Sicilian if White follows up with 3.Nf3/3.Nge2 and 4.d4. However, it may be better from a marketing point of view to provide an Anti-Sicilian repertoire, as such a repertoire could be covered in more detail and with more new ideas for White than a repertoire book on the Open Sicilian. Personally I would prefer an Open Sicilian repertoire, though. Milen, how much do you acually remember during a game from a repertoire book like the Khalifman-Series? I am a correspondence player and I use every source I have access to in order to improve my own opening repertoire. I need a high quality and in depth information, but not only a short overview. So this book certainly will not cover my expectations. Hmm. It's difficult to please everyone. 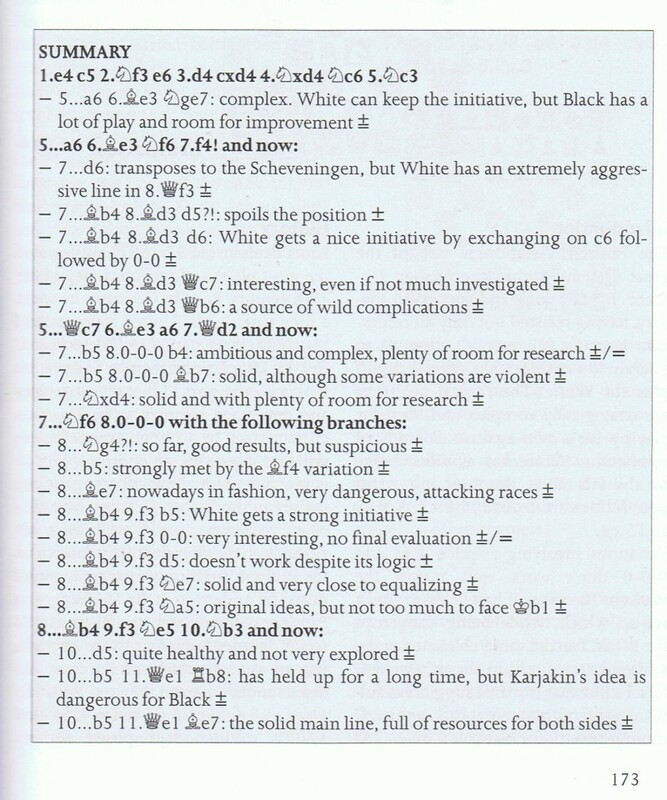 Chess opening books are either too complex (like Khalifman series) or too basic (like Starting Out series). Also, even the most complete books have omissions. I've seen the spanish edition. Looked very nice and I liked most of the choices of lines. I think this book has a market. I agree that these books can not cover everything but there are certain ommisions there. Look for example the chapter on Rauzer in Experts vs Sicilian. Do u think that the coverage of the 6...Qb6 is full? I do not think so. If you have doubts check the Open Sicilian section for subscribers where i shared my analysis. With my full respect to the authors and editors I do not think that it is possible to offer a complete repertoire in just 200 or so pages. For overview purposes it is OK, but no more. Frankly speaking I am pesimistic about this book. How one can offer a full complete repertoire based on Open sicilians in only about 300 pages... Looks like this will be an overview for beginners to intermediate players, but not in depth coverage. I have the spanish version of the book and for me it is nothing more than a selection of well (but not very good) commented games. Nothing new there. If the nw edition will be in the same quality then no idea to go for this book. It's interesting that there now seems to be an expectation that any repertoire book must be encyclopedic in nature and have many hundreds of pages, if not multiple volumes. It might be noted that "Experts versus the Sicilian" (2nd edition) and Nunn and Gallagher's "Beating the Sicilian 3" both had a page count in the 220s (though the former had a larger format). It's a repertoire based on the English Attack. I don't know yet. However, given the publishing house and their pretty good quality works released so far, I think there'll be some new things for the English version. Is it updated or just translated? This will be published by New In Chess in November. It promises to be interesting although his record against the Scheveningen is not very good. Still, it'll be another arrow in White players' quiver.